We would love to see you at State Field Day for our Robotics event. This year we are hosting a 4-H Robotics Competition and Drop-in Robotics Activities. Details for each are listed below. You can also bring your own robot for a demonstration if you do not want to participate in the competition event. The State Robotics Events is a place for 4-H members enrolled in robotics to showcase their accomplishments. It also provides an opportunity for you and your leaders to network with others across the state who are interested in robotics and other STEM-related programs and activities. This will be a low stress event and we want everyone to have a successful and positive experience. Stop by and learn how to program robots! These events were planned by the STEM Advisory Committee. For competition questions, please contact Dennis Derickson, ddericks@calpoly.edu or Maria Thomason, napathomasons@gmail.com. Pre-registration is recommended to save a time slot to compete in the Robotics Competition. On-site registration will be accepted if time slots are available. You can use any robotic platform to compete. Space and electricity will be available for participants who want to make modifications to their robot or programs. Practice runs may be scheduled as time allows. Registered participants can arrange practice runs and make adjustments to their robot or programs. If there are time slots available, walk-in participants will be accepted. Registered individuals and teams will demonstrate how their robot completes this year's challenges. Watch the YouTube video for an example of this challenge. Rules: AUTONOMOUS ROBOTS: The egg is placed in the holder (by hand) at the beginning of the course. 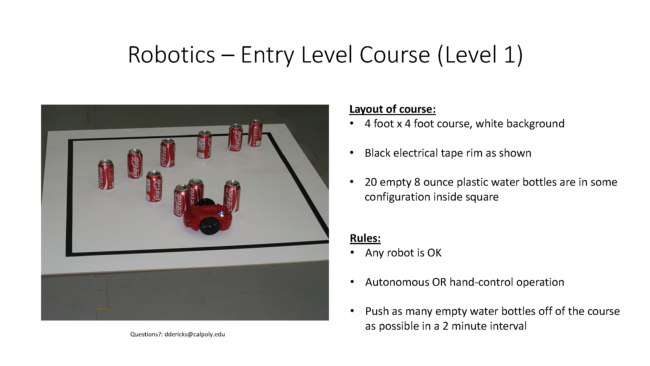 The robot must follow the black line to the end of the course and place the egg into a cup filled with water. If an obstacle is placed in the middle of the course, the robot will stop and wait for the obstacle to be removed. The robot must perform this operation three times in a row successfully. 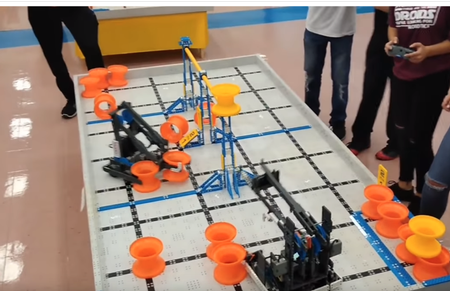 The robot teams can place their cup any distance after the black line ends. 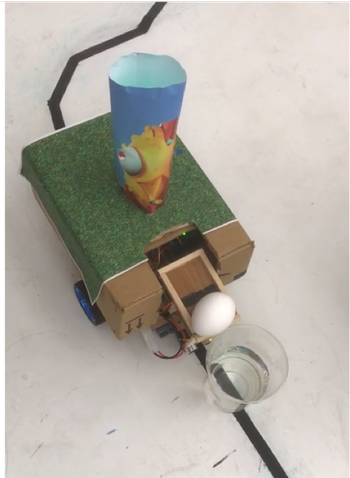 Rules: USER-DRIVEN ROBOTS: The robot must be able to pick up the egg from the floor and transport it to the cup filled with water three times in a row. The robot must avoid all obstacles put in its path from the egg pick-up point to the egg drop-off point in the cup of water. Watch the YouTube video for a general overview of the course. The 4-H challenge will use the same course and hardware, but with different rules. ANY robot, not just VEX robots, are welcome in this activity. Rules: AUTONOMOUS ROBOTS: Push all of the orange round objects to within 1 inch of the outer wall. The robot has two minutes to do this. Each orange round object within 1 inch of the outer walls scores 5 points. Each round object within 2 inches of the outer wall scores 2 points. Rules: USER DRIVEN ROBOTS: Teams compete in the Robot Skills Challenge where one robot takes the field to score as many points as possible by scoring and stacking orange round objects in Building Zones, removing round objects from the Hanging Structure, and by parking under or hanging on the Hanging Bar. Allow for two minutes to manipulate the orange round objects. VEX I-Q robots will be separately scored from non-VEX-IQ robot entries. We would love to see many VEX entries from around the state in this competition as well as non-VEX entries to see how they compare. We encourage all of you to drop-in to our tent area. Scribbler 2 robots and adult leaders will be available to help you learn how to program a robot to complete the Entry Level challenge. No experience required! You can also bring your own robots or robotic kit and collaborate with other 4-H members during the event. Design, build, and program robots on the challenge courses. You can network with 4-H members and leaders from all over California who are using robotics as part of their county 4-H programs. Safety: The egg must arrive in the cup without damage to the shell of any kind. Speed: The total time to load, transport, and dispense the egg should be minimized; and must not exceed 60 seconds for a 13 foot, obstacle-free path. Aesthetics: “Sleek simplicity” in the appearance of all parts of the system. The basic robot will need to be “dressed up” to appear like a professional product. Autonomous Robots: Each orange round object within 1 inch of the outer walls scores 5 points. Each round object within 2 inches of the outer wall scores 2 points. User-driven Robots: The object of the game is to attain the highest score by scoring and stacking orange round objects in Building Zones, removing round objects from the Hanging Structure, and by parking under or hanging on the Hanging Bar.